A new system to give people direct input into Welsh assembly decision-making has begun with the first meeting of a petitions committee. The assembly committee considered petitions on re-opening a Powys railway station, the Children's Hospital for Wales and a residential home's closure. Suggestions could be passed to the assembly government or whole assembly. 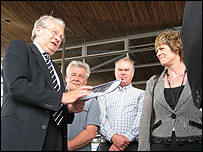 Presiding Officer Dafydd Elis-Thomas said he wanted an "open, responsive, effective" system. 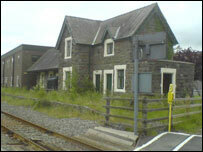 Nearly 800 people have called for the reopening of Carno railway station in Powys, to help boost the local economy. Action group chairman Tony Burton said their cause was "tremendously good" because there was a stretch of 22 miles of track without a station. Nearly 6,000 people have demanded "no more procrastination over the Children's Hospital for Wales". Patients were admitted to the first phase in February 2005 at the University Hospital of Wales in Cardiff. The second phase - once built - will house an intensive care unit, theatres and surgical wards. The assembly government has agreed to put £2m a year towards the running costs but health bodies are discussing how to find another £3m. A third petition, with 33 signatures, was submitted by Derek Brown, a relative of a resident at Glyndulais nursing home in Crynant near Neath. It calls for residents to be able to stay at the home as long as they wish, despite a council decision in March to close it. Downing Street already has an online petition service to the prime minister on its website, which was launched last year. The assembly's petition system is at an early stage but Lord Elis-Thomas has invited suggestions on how to make it work. He said: "I find the idea of the public petitioning the assembly very exciting and I am keen for the system to be as open, responsive, effective and efficient as possible. "I welcome all views on how the system can work and how we should proceed and I look forward to receiving the petitions". Ideas can be e-mailed to petition@wales.gsi.gov.uk or sent to The Table Office, The National Assembly for Wales, Cardiff Bay CF99 1NA.